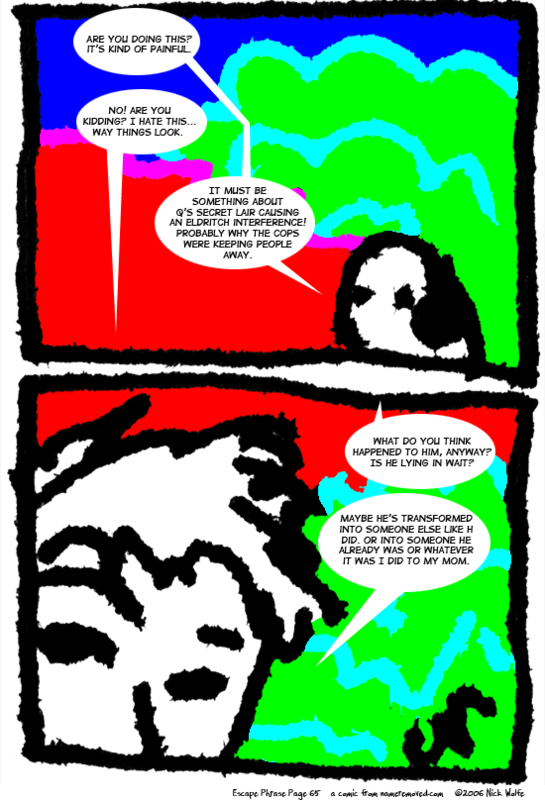 For maximum effect, view this comic at an approximately 1.5 centimetre distance from the screen. And turn your brightness up all the way. Optimally, view it on a blurry old colour tv set that smells like ozone when you get close to it and always tickles your nose with static electricity. Jimothy: Are you doing this? It's kind of painful. Tsamantha: No! Are you kidding? I hate this... way things look. Jimothy: It must be something about Q's secret lair causing an ELDRITCH INTERFERENCE! Probably why the cops were keeping people away. Jimothy: What do you think happened to him, anyway? Is he lying in wait? Tsamantha: Maybe he's transformed into someone else like H did. Or into someone he already was or whatever it was I did to my mom.